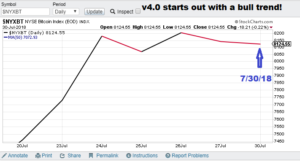 V4.0 issues a bull trend signal! $NYXBT (Bitcoin), 7/30/18 , bull signal. TSP will be the close of Aug 1, 2018. Model notes: V4.0 is now online. More notes to follow. Bull Trend Signal ($NYXBT): More noes to follow. 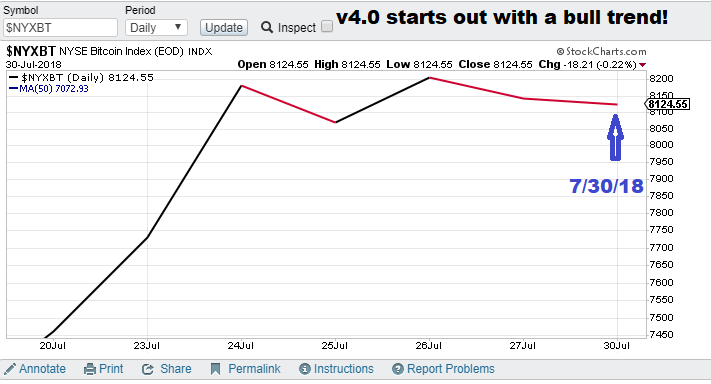 Previous PostSystem maintenance, preparing to put 4.0 online.Next PostV4.2 issues a bear trend signal!